Type specific indicator variables and thresholds are being considered to improve the accuracy and management implications of the model. Water body type and thus response to nutrient inputs dictates appropriate variables to monitor, sampling timeframes and spatial scales, and appropriate management actions. 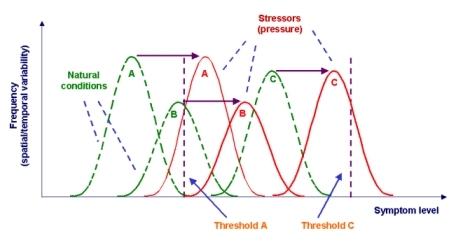 This is illustrated in the Figure for three different types of systems (A, B, C); they have different background levels and different thresholds for where response to nutrient inputs reaches undesirable conditions. Appropriate management measures for these systems may also be different. The intent is to keep the number of types as small as possible, with use of a subset of systems as representatives from a type to reduce monitoring costs while maximizing management success. 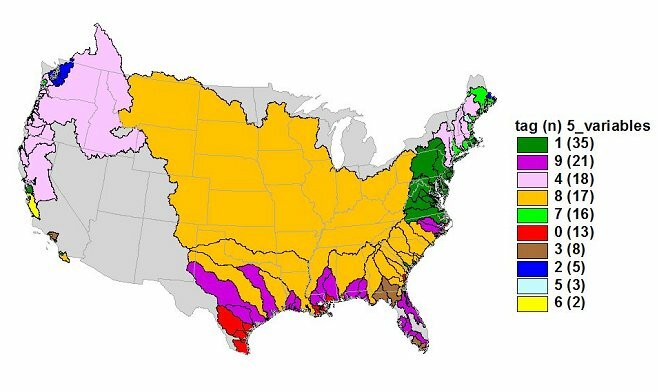 A preliminary type classification for 138 US and 10 Portuguese estuaries has been made using data for physical and hydrologic characteristics with the Deluxe Integrated System for Clustering Operations (DISCO). Details of the methodology can be found in the TICOR report, together with results for some EU systems. The different types are color-coded, and the number in brackets for each color corresponds to the number of systems which are classified into a particular type.